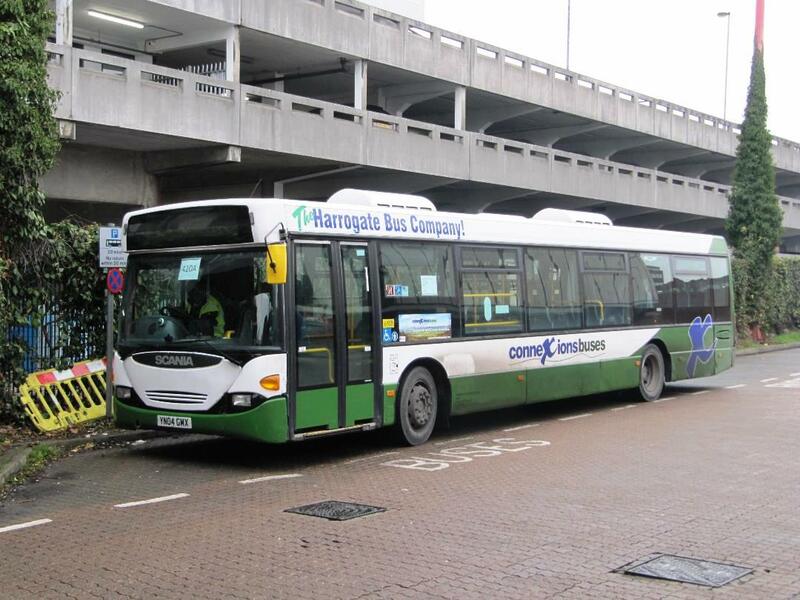 The LCB Travel recovery continues with the recommencement on 1 April of the LCB2 service alongside the ZIP. The same combination was also noted on 4th April and so we assume that has been been the position all week and the LCB1 return is still awaited. 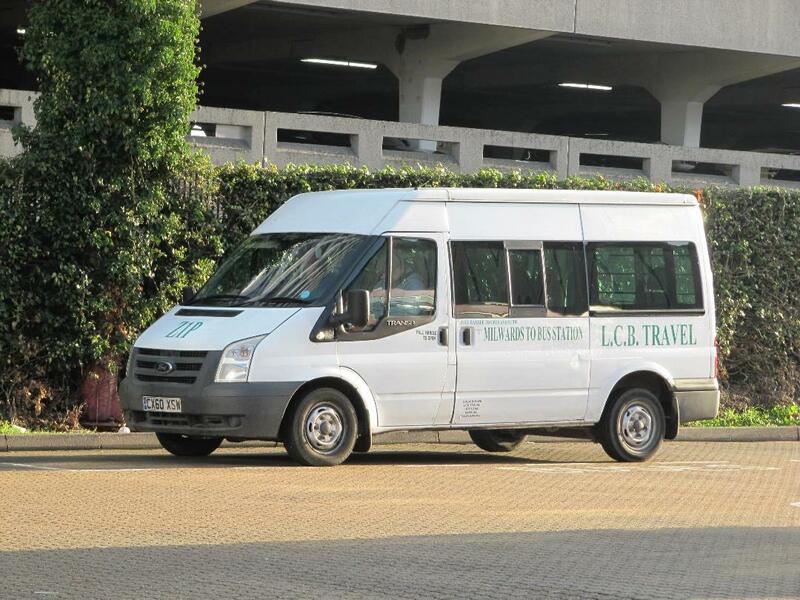 LCB Travel stopped operating, for a short period of time. N&P's (dated 27 February, objections by 20 March) report that their license was revoked and route registrations cancelled. A short notice in the bus station adviced passengers of the change. We suspect this took effect from approximately 8th March. There was talk locally of them returning, although nothing official on government websites confirmed this. 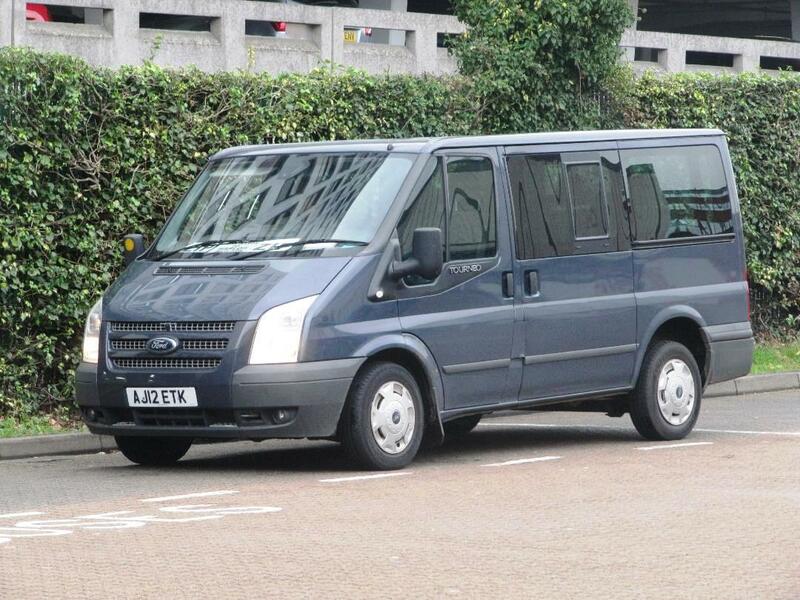 Then on 27 March the ZIP service was noted running again in the hands of regular branded Ford Transit CX60XCW. 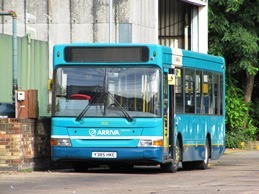 At Arriva a third DAF SB120/Wright Cadet has arrived in 3521 (LJ03MYG). Presumably all 3 are for the long term, such as can be expected for 16-year old vehicles at least. 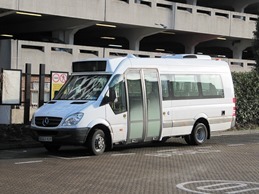 Another "third" is the appearance of Mercedes-Benz Sprinter 45 minibus 1019 (BF67WGV). 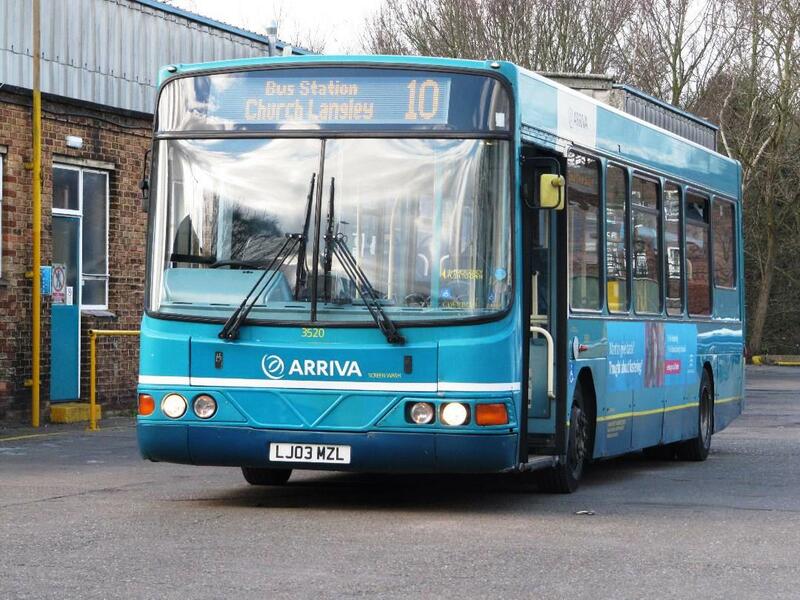 Arriva buses at Harlow are now able to accept contactless payment, first noted from 11 February. By 18 February, the 2 loan buses mentioned last month would seem to have moved on, to be replaced, it seems, by once London Dennis/Alexander Mini Pointer Dart 1594 (LF52UOP) from neighboring Ware depot and DAF120/Wright Cadets 4536 (LJ03MYM) and 3520 (LJ03MZL), both also from within the Arriva Kent Thameside fleet and ex Arriva London South. 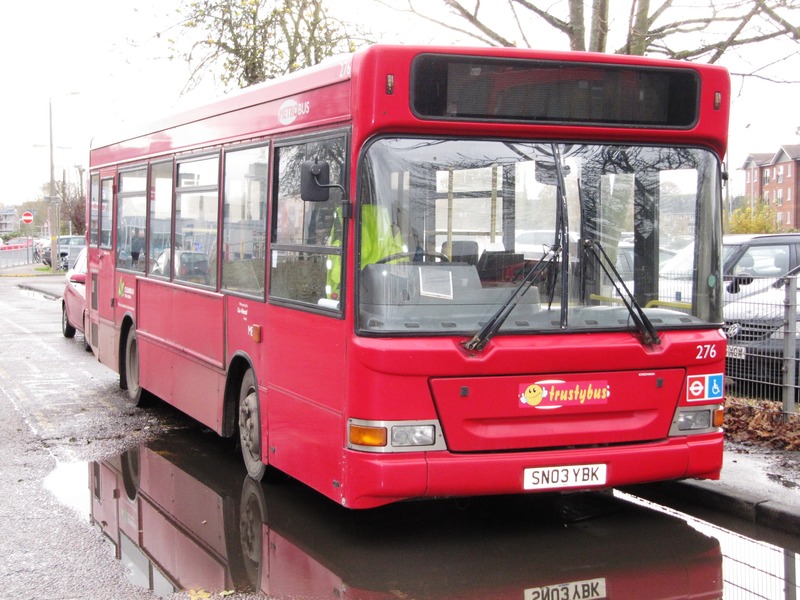 Trustybus have also added another Dennis Dart SLF/Alexander Pointer to their fleet. 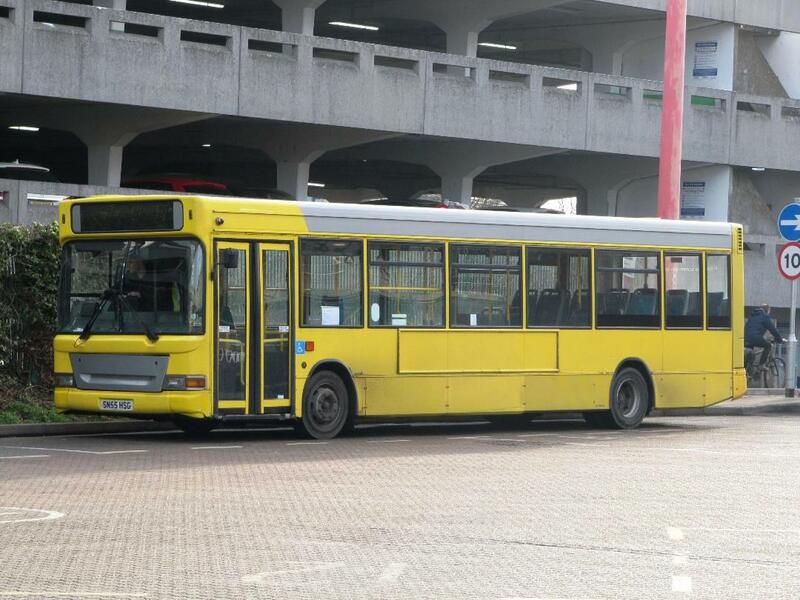 The vehicle in question this time is former Yellow Buses (Bournemouth) SN55HSG, still in yellow, but with a silver front grill, roofline and blind masking which it had, oddly, in its former life. 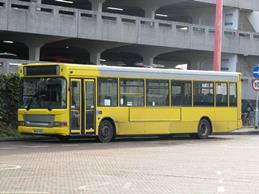 Added to that and even more in a class of it's own, Dennis Dart SLF/East Lancs Mylennium PE55WPP. At LCB Travel, a new entrant on the town network is Ford Transit HJ60ONA in silver. A couple of new arrivals at Trustybus, adding to the fleet of Scania CN94UB Omniciti vehicles, are YN04GMV and YN04GMX. Unlike the former London examples, these are in single door configuration. Most striking though are the liveries. 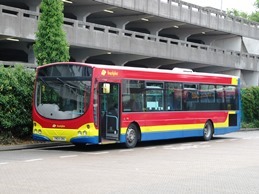 The former carries a heritage livery for West Yorkshire from NBC poppy red days, whilst the latter is in white and green Harrogate Bus Company colours. 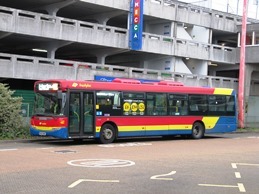 YN04GMV entered service with cherished registration 5480WY, although that was changed in the first week. 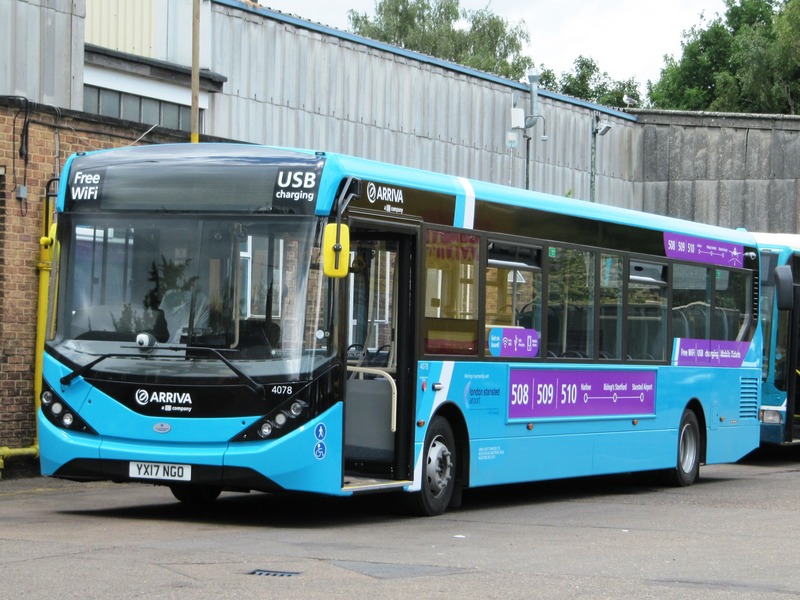 At Arriva, a couple of vehicles new in to support the local fleet are Alexander-Dennis Enviro 200 3986 (GN07DLO) and Optare Solo M950 2485 (YK07BEU). Whether these are loans or transfers is not yet known. 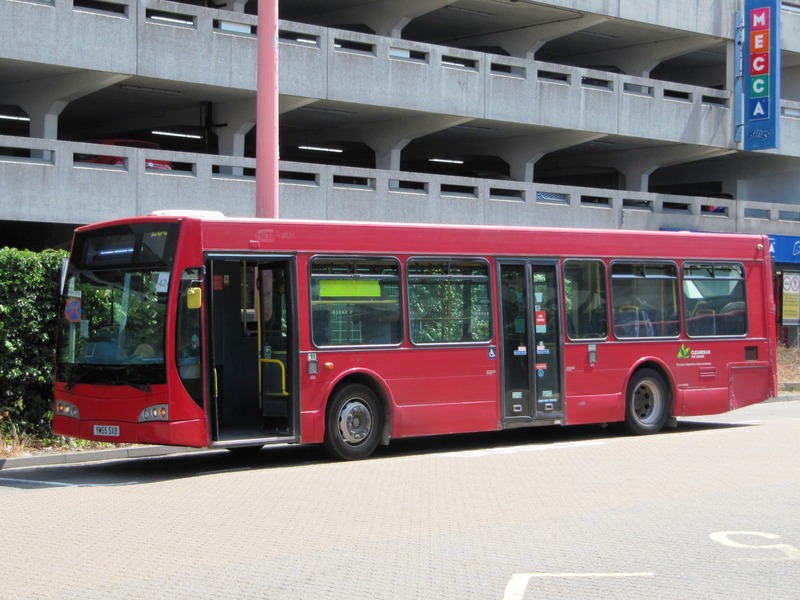 Essex County Council have launched a consultation indicating reductions in subsidies for evening and Sunday services. The evening routes would effectively cease at 10pm. All Sunday services are shown but the extent of possible withdrawals is unclear. CX60XSW is a Ford Transit in a white-based livery with branding for the ZIP service. 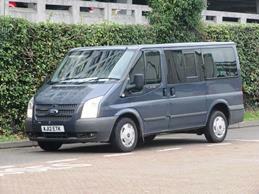 AJ12ETK is a Ford Tourneo Trend in a dark gray base. 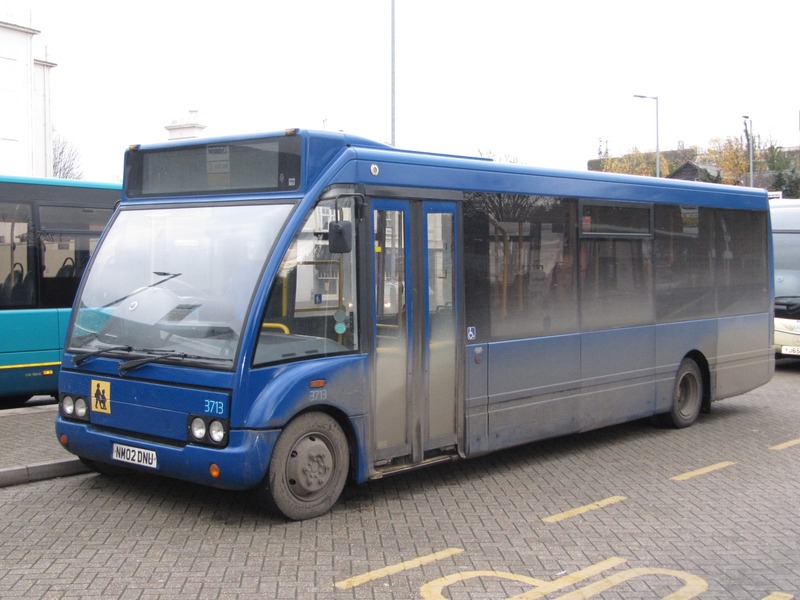 At Trustybus, the fleet of one-time Scania N94UB/East Lancs Vyking Myllenium vehicles have now finally all disappeared and are in the process of being scrapped. 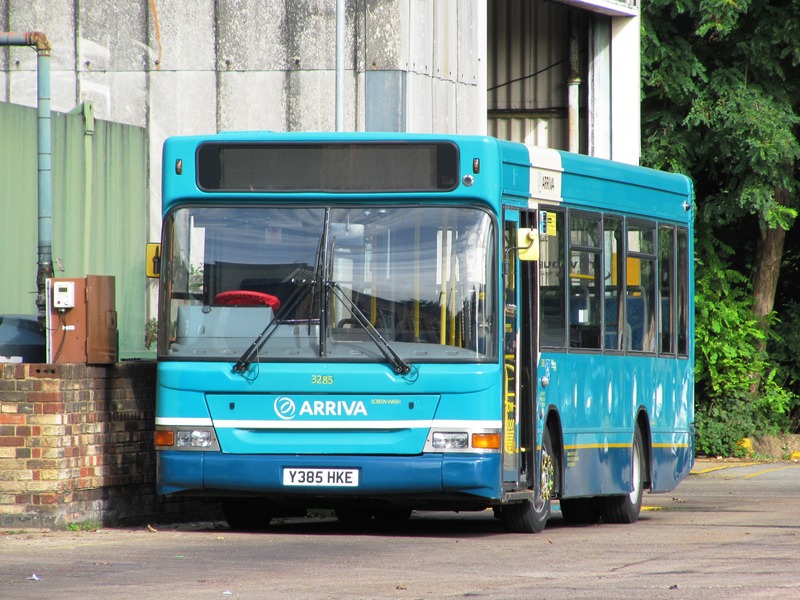 Adding to the departures of emergency EOS replacement vehicles reported last month at Arriva, E200MMC 4167 (YX17NME) has also now left, leaving the fleet of that type of vehicle as just the native 508/9/10 membership of 12. 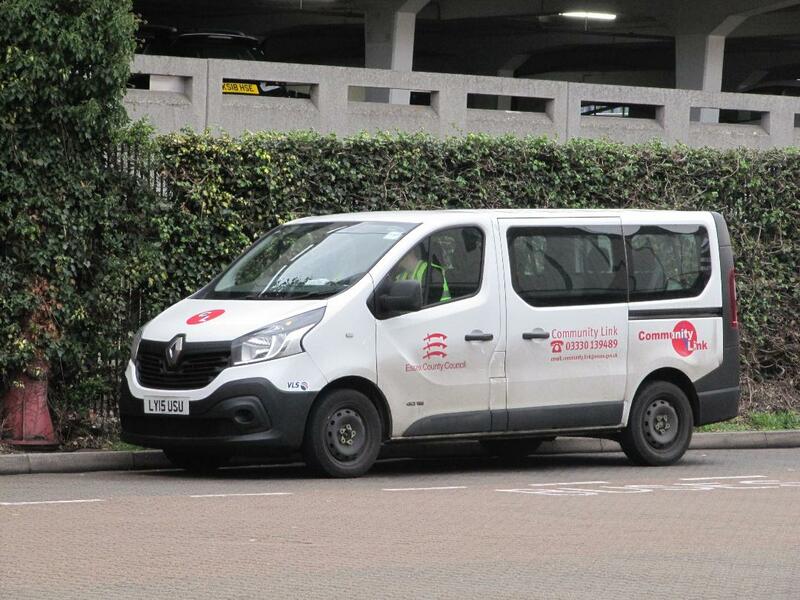 A new type sighted in service with Essex Community Transport is the Renault Master with Stanford Conversions M10L bodywork, represented by vehicle registration EU10ECD. 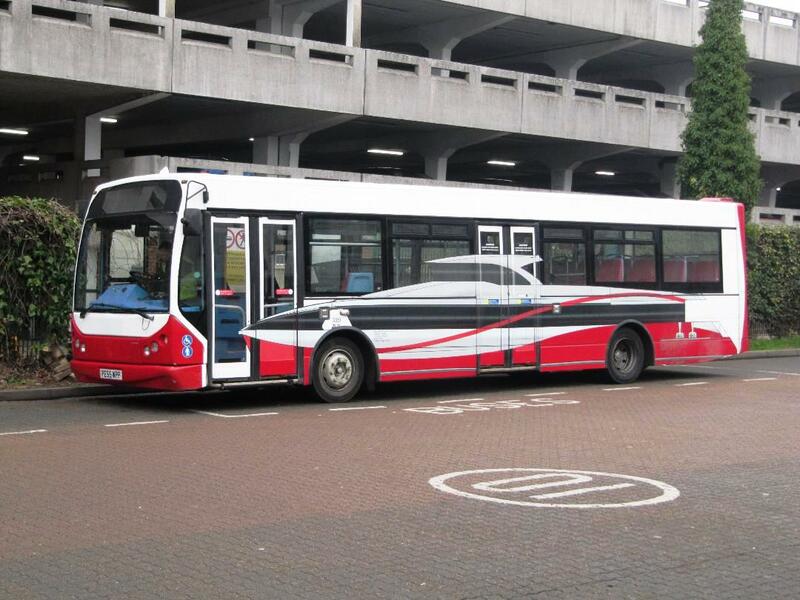 A slightly modified livery has appeared on Trustybus Mini Pointer Dart SN03YBS. The blue and yellow stripes at the rear follow the body contour rather than swooping up. At this stage the red is that inherited from Metrobus. 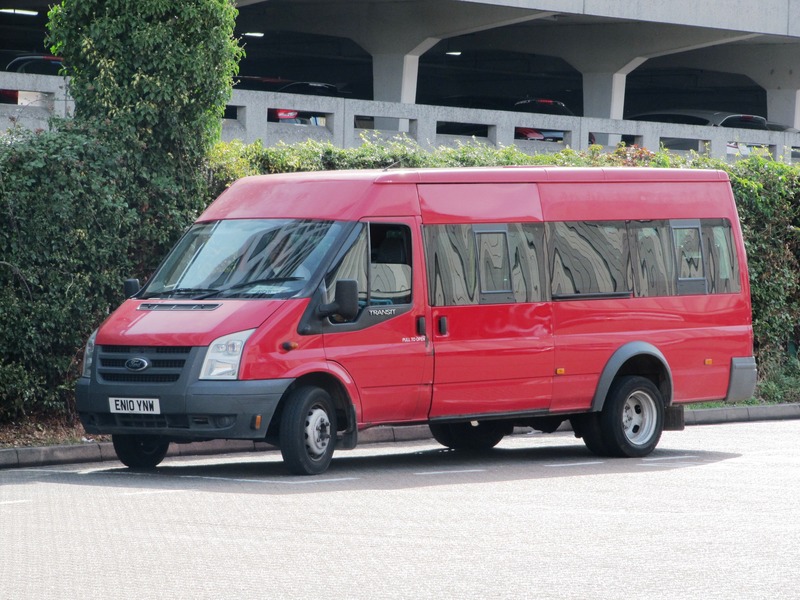 The services of LCB Travel remain largely a mystery, but a vehicle not previously reported is Ford Transit EN10YNW. It stands out from the crowd for a minibus in Harlow in being in red livery. 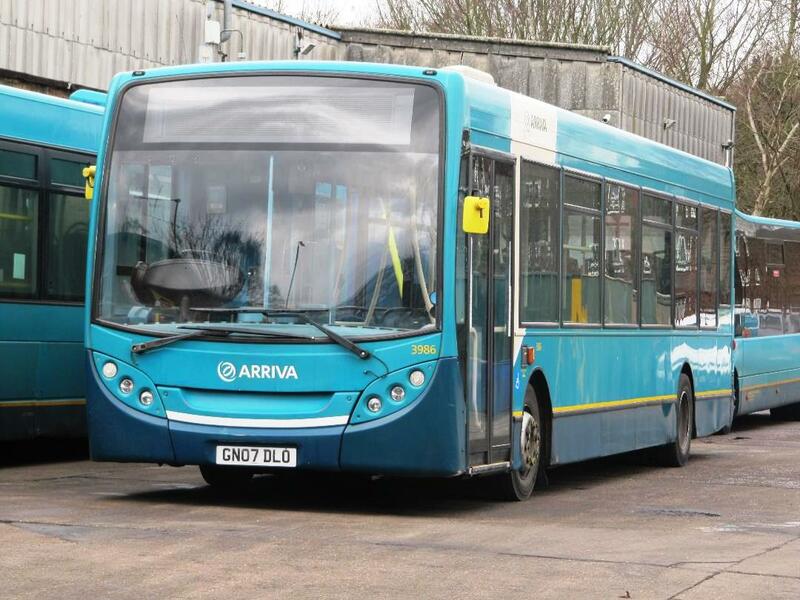 A new arrival at Arriva is Alexander-Dennis Enviro 200MMC YX17NME. Visually identical to the existing batch although fleet number 3106 is numbered in the Shires sequence rater than the Kent Thameside one, assuming it retains that number. 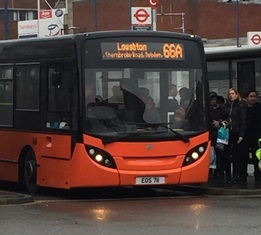 It would seem that the former EOS route 66 is now being worked from Ware and with that change all of the various and mainly non-standard rushed-in vehicles have now left. This includes E200MMC 4124 (SN67WUO), Enviro200 1641 (GN57BOH), DAF /Wright Cadet 3523 (LJ03MYK) and Wright Streetlites 4282 and 4284 (GN14DYA/C). 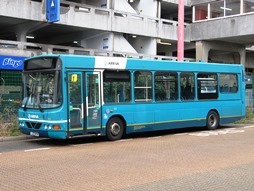 Coming the other way and probably a better fit with the local fleet is Optare Versa V1110 2990 (YJ09MKD). 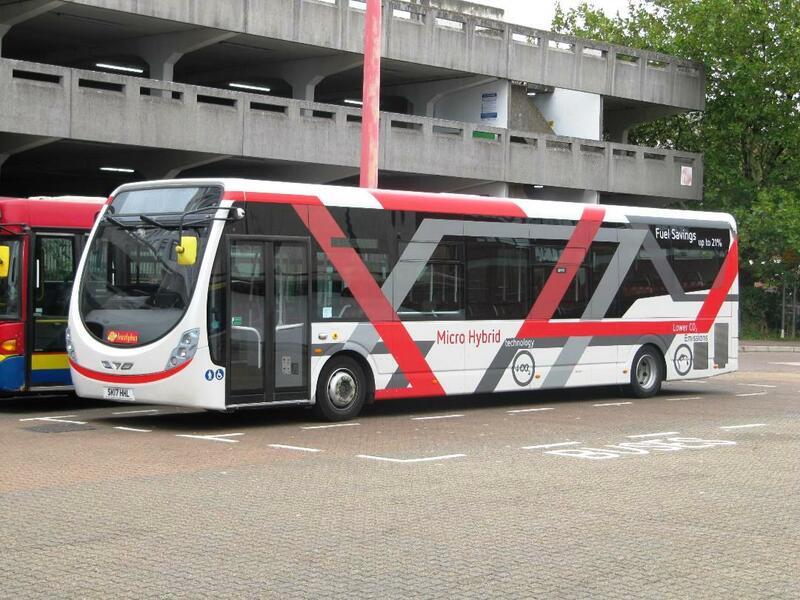 An unusual sight running through Harlow was Wrightbus Streetlite Micro-Hybrid demonstrator SK17HHL, in service this month (noted 18th and 19th) with Trustybus in a white based livery with grey and red angular designs on. This was followed on 29th by all white Wright Streetlite DF 33-seat SK68TNF. 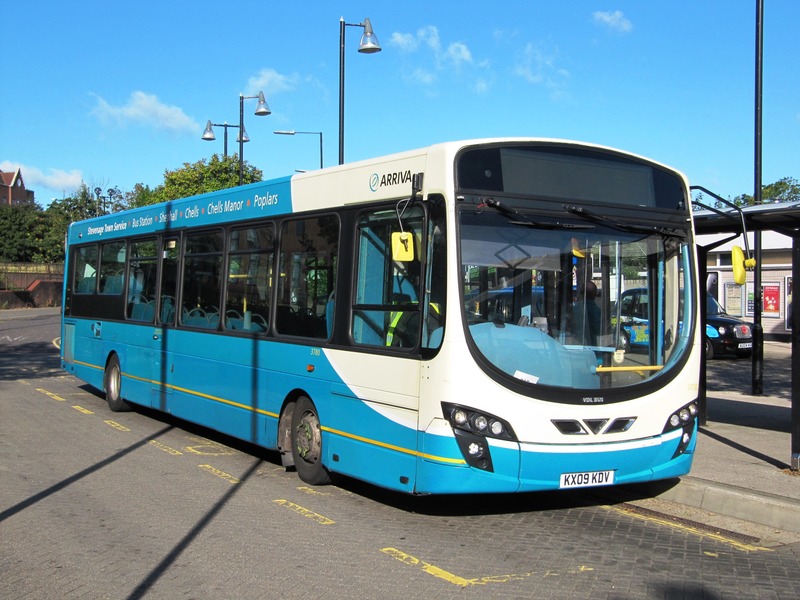 Due to legal issues (with the traffic commissioners) Arriva were not able to assume the 86 and 87 (along with the 66) on Wednesday 1st August as planned, accordingly EOS continued with a limited operation on 1st and 2nd August. Taken from their own twitter feed, this was stated to be as follows. Announced on the evening of 31st, initially the 66 was to be covered by a complimentary shuttle bus between Waltham Abbey and Loughton every 45 minutes between 06:00 and 19:00 whilst the 86 and 87 would not operate. 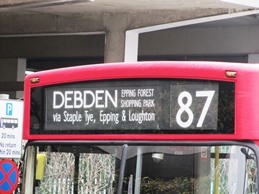 By early morning on 1st it was announced that route 86 would run hourly between 10:00 and 19:00 and 87 would operating between Oakwood Hill and Debden Broadway only between 09:30 and 18:30 (no service Harlow to Debden) whilst the 66 would operate hourly Waltham Cross to Debden (taken to mean the whole route). 66 - An hourly service on the 66 from first till last bus. 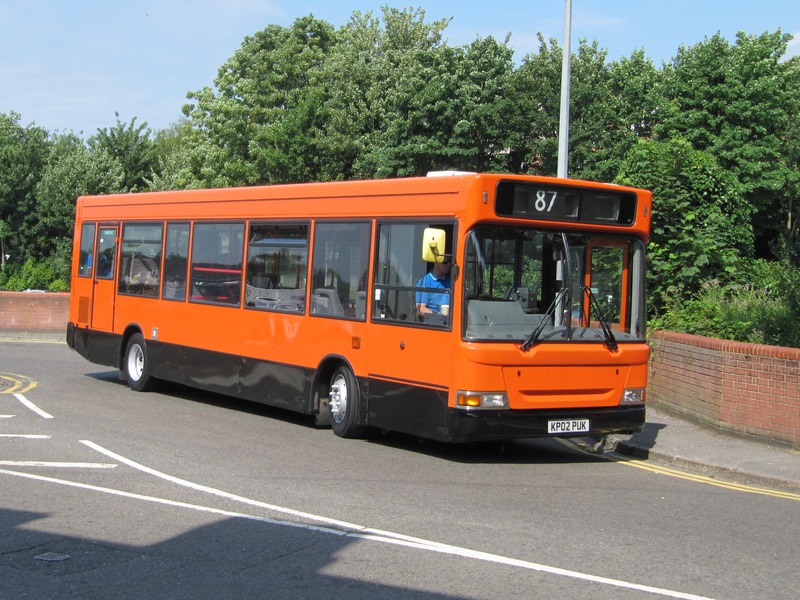 87 - Hourly between Harlow and Epping from 0600 to 1900 and also hourly between Oakwood Hill and Debden Broadway. Closing the month with some vehicle arrivals. Firstly at Arriva Mercedes Citaro 0530 fleet number 3909 (BD12DHV). This bus was a bit of a rally regular for some time. 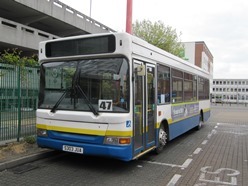 Part of a batch of 15 that was delivered to what was then TGM it is one of 2 which were B29F rather than B37F and for a while was dedicated to frequent Maidstone town service 82. 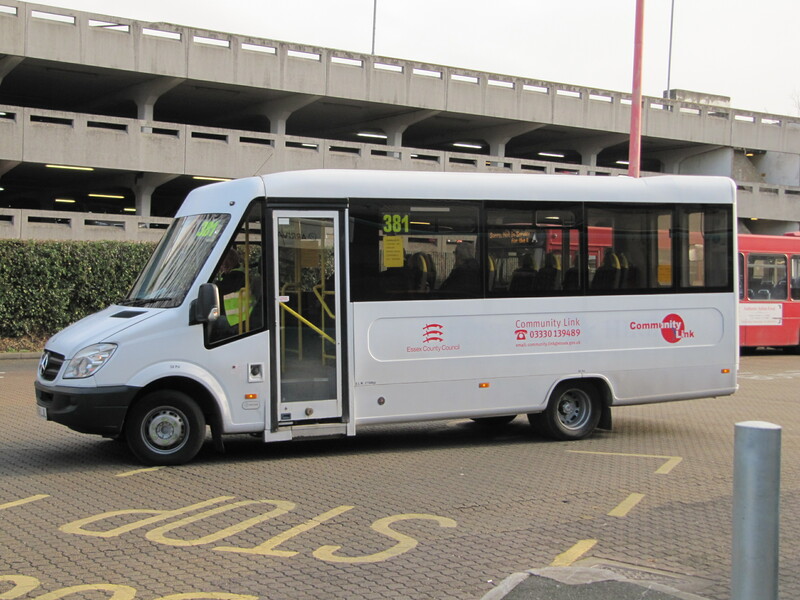 Unlike the other Citaros at Harlow, it has bus rather than dual-purpose seats. 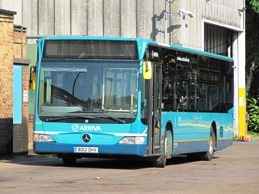 Also at Arriva Harlow, Mercedes-Benz Sprinter 45 fleet number 1010 (BF67WGE) has reappeared following a stint at Ware on the 251. This gave rise to the unusual sight of both Sprinters operating at once on 31st. Moving on to Trustybus, two further Scania N94UB/East Lancs Esteem vehicles joining the two recent acquisitions. Again both ex-Metrobus, this time YM55SXB and YM55SXH. 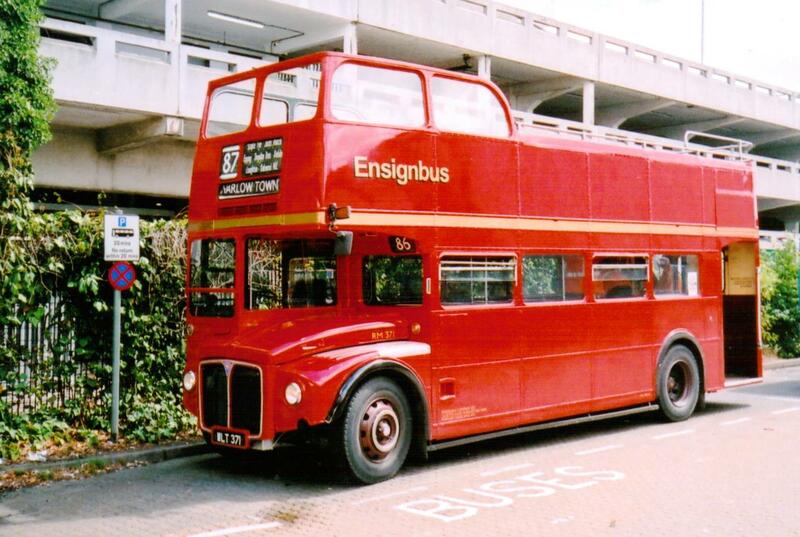 For the last day Ensign's RM371 operated certain journeys on the 66, 86 and 87. Still at Arriva, Enviro200MMCs 4084/5/7, having operated in service without 508/9/10 branding since new, have now all been treated. 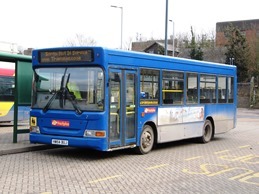 Another former Damory Mini Pointer Dart noted in service with Trustybus is HW54BUO. In the same fleet, a second Scania N94UB/East Lancs Esteem, this time YN06JXR, also former Metrobus, retaining London-spec dual doors. In the Trustybus fleet, a new combination, being the Scania N94UB/East Lancs Esteem YM55SWU . 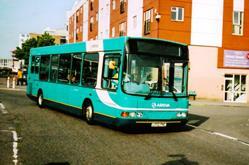 It is ex Metrobus. The presence of First in the town is limited to the 2-hourly 59 ECC Sunday service, but it was visually enhanced when 44662, an Alexander-Dennis Enviro200MMC, performed the duty. 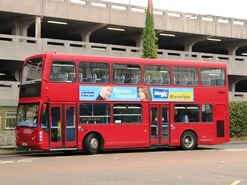 EOS started major new 7-days per week service S1 to Stratford on 4 June. 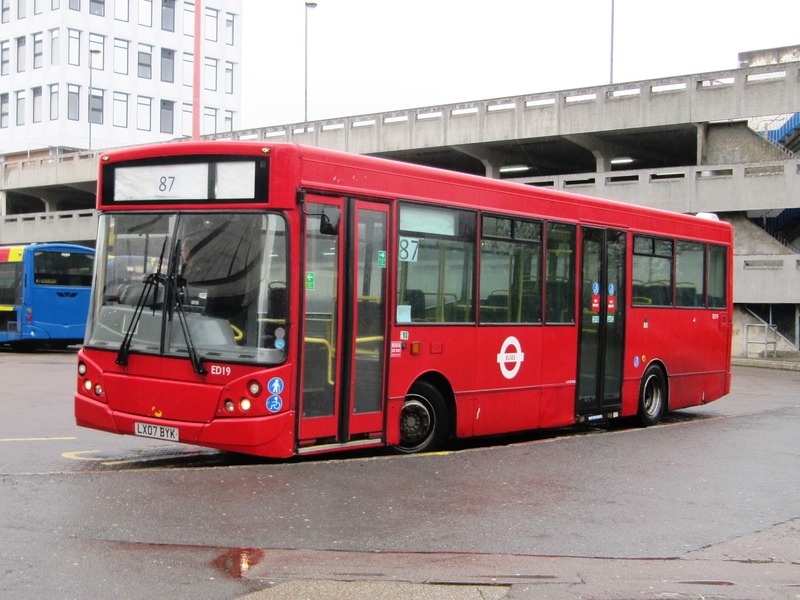 Former Go-ahead London Alexander Dennis Enviro 200 / MCV Evolutions in red livery are used and feature neat white on blue conventional blinds. 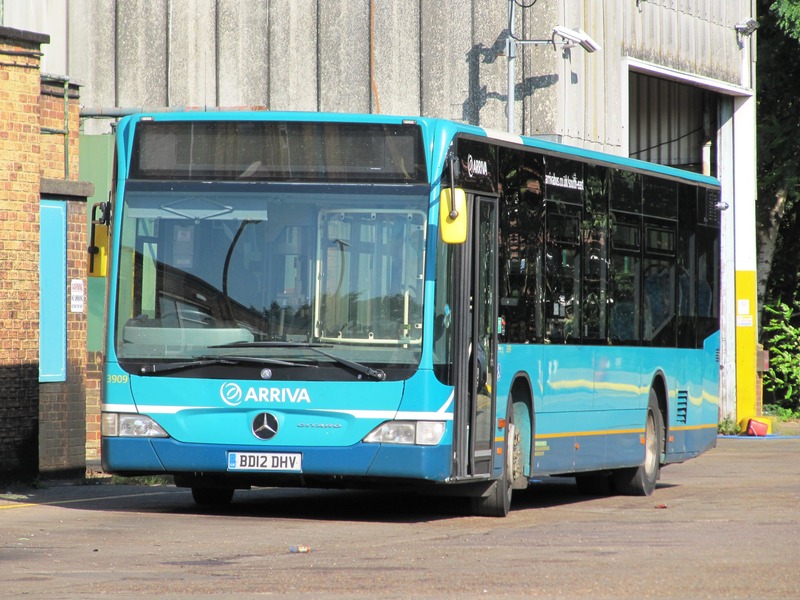 Of the 2 Mercedes Sprinters seen in service recently with Arriva, 1011 now seems to have left, replaced by 1015 (BF67WGN). 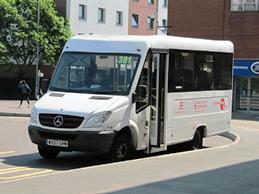 A brand new Mercedes-Benz Sprinter noted on ECT service 381 is LX18BYO. Livery was all white without logos when seen on 20th. 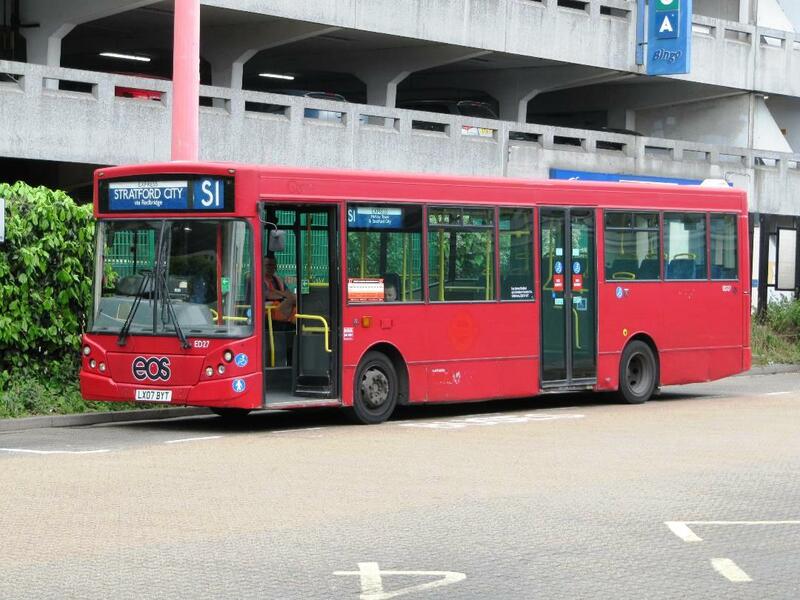 Joining the former Southampton (Blue Star, Damory) Transbus MPD's reported last month is SN03ECA. 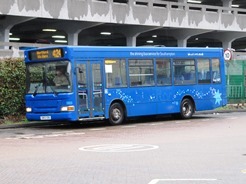 Noted in service with Trustybus in blue with stars. 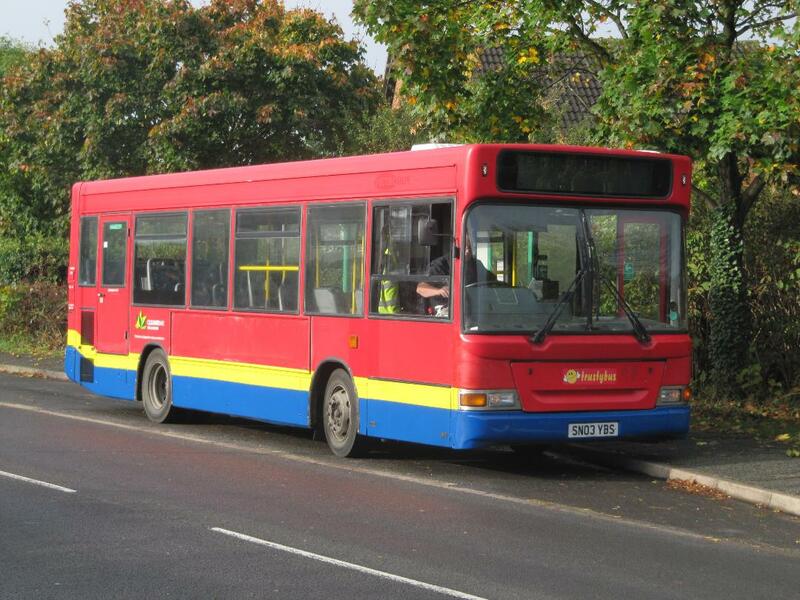 Also reported as acquired, although not yet seen in service, is Dennis Trident/Alexander X336NNO. 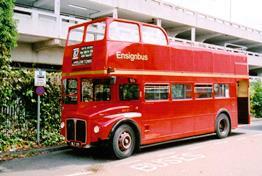 This one time Stagecoach London vehicle was last operated by Golden Tours in a partial open-top condition. Arriva have a problem. Attempts to introduce minibuses in 2 parts of the region have not proved popular and new homes are being sought for them. 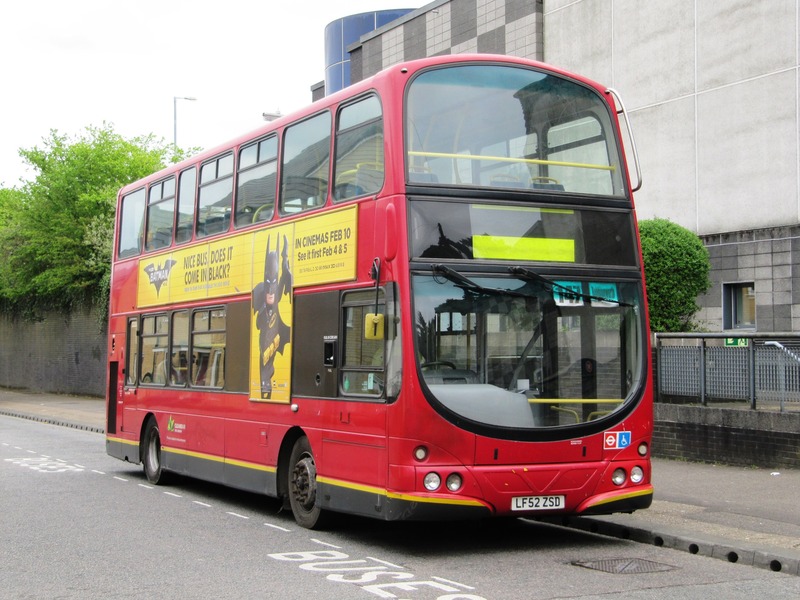 Mercedes-Benz Sprinter 45's 1010 and 1011 (BF67WGE and BF67WGJ) have both been sighted on the 6/8 local service. Typically one or the other appears. Paper in windscreen suffices for a route number. 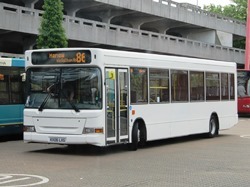 In more regular news, another Volvo B7RLE/Wright Eclipse Urban has been added to the fleet. 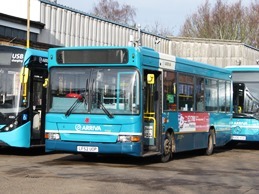 3820 (GN07AVG), uniquely for Harlow, carries Arriva MAX livery. Whilst it has mainly been seen on the 10, it did appear on the 724 on 13 April. 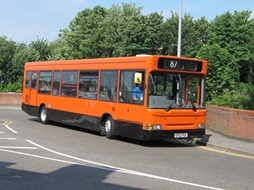 Similar former native 3859 (KE54LPJ) has also been noted back in operation at Harlow. 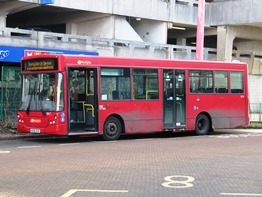 Whilst the Volvo stock was boosted for the expansion of route 9, other vehicles do appear on that route, including 508/9/10 branded E200MMC 4076 (YX17NGJ), also on 13 April. 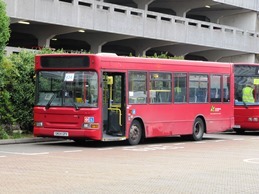 Noted in service at Trustybus, 3 former Go-South Coast Mini Pointer Darts. 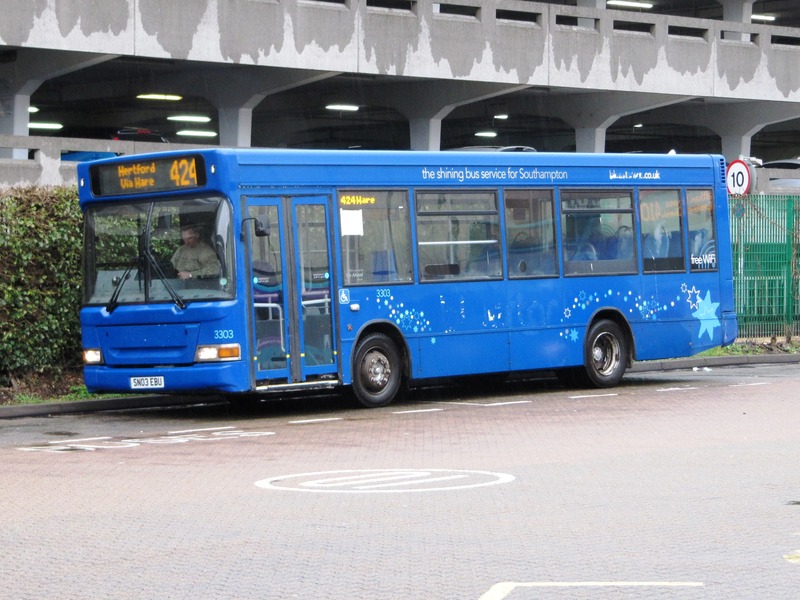 SN03EBP and SN03EBU are in blue, the latter at least with Southampton local branding, and are badged as Transbus vehicles. From the same source is HW54BTZ, badged as Dennis/Alexander. 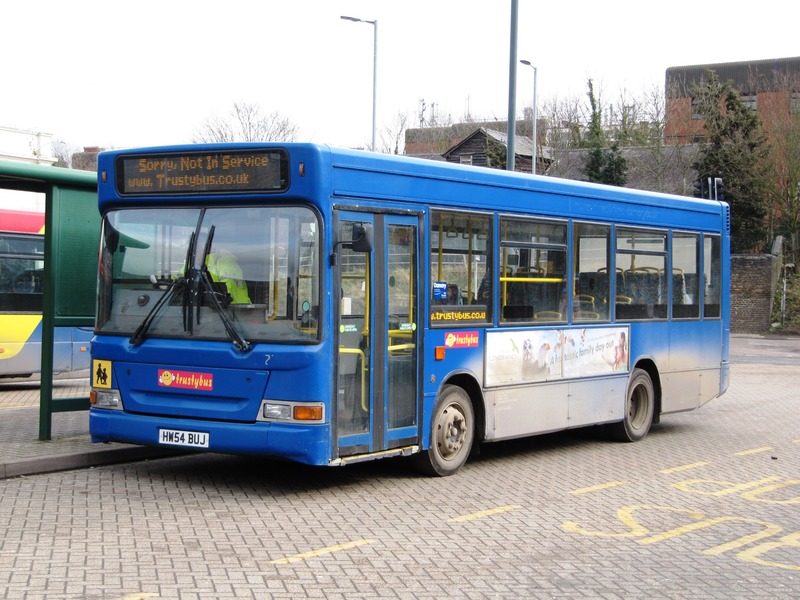 The once 13-strong fleet of former Go-North East Volvo/Wright Renowns appear to have been all stood down from service and have been removed from the fleet list. At EOS the expansion of the 87 has brought with it a new final destination in Debden, Epping Forest Shopping Park. 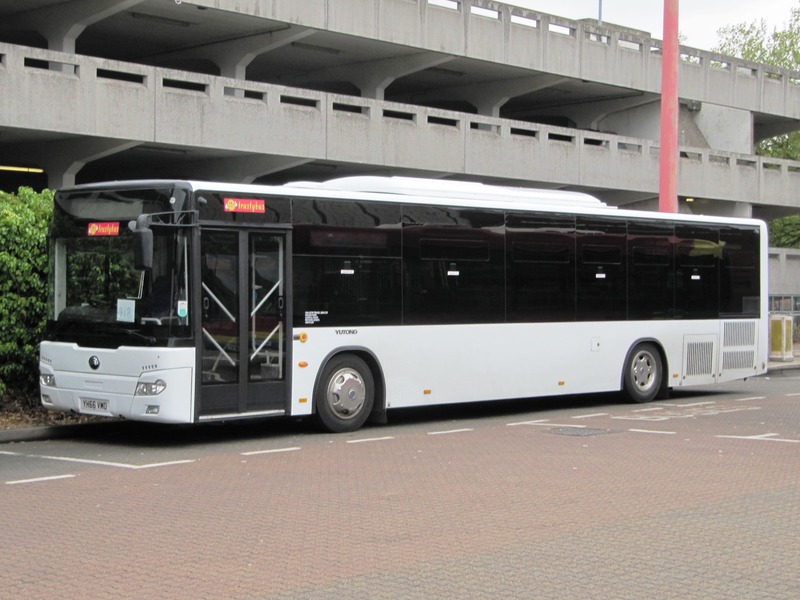 Very neat white on black destination blinds have been fitted to some vehicles including former Docklands/Go-ahead E200/evolution LX07BYL, shown above. In the process, the two white Mercedes Sprinters would also seem to have been made surplus to requirements and are removed from the fleet list. The march of the new vehicles continues at Trustybus, firstly with Wright Solar bodied NK53UNW and NK53UNY. The former at least is in full colours. 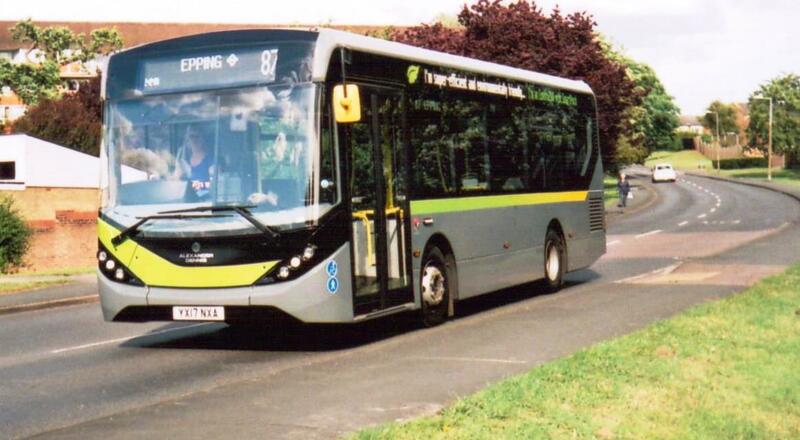 Next, newer yet somehow far less dashing, is also newly arrived Alexander-Dennis Mini Pointer Dart HW54BUJ. 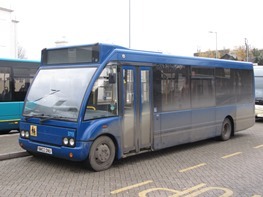 Perhaps the blue livery of former operator, Damory, does it less justice. 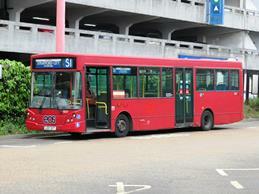 Finally, Optare Solo M850's SF05NXD & SF05NXE. 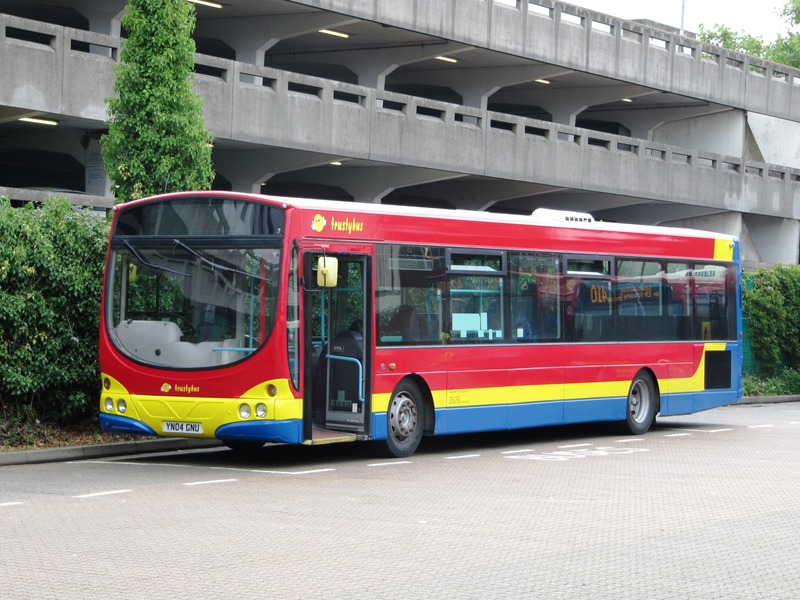 NIBS, an operator in Harlow on Sundays only, will cease to be so after 25 March. 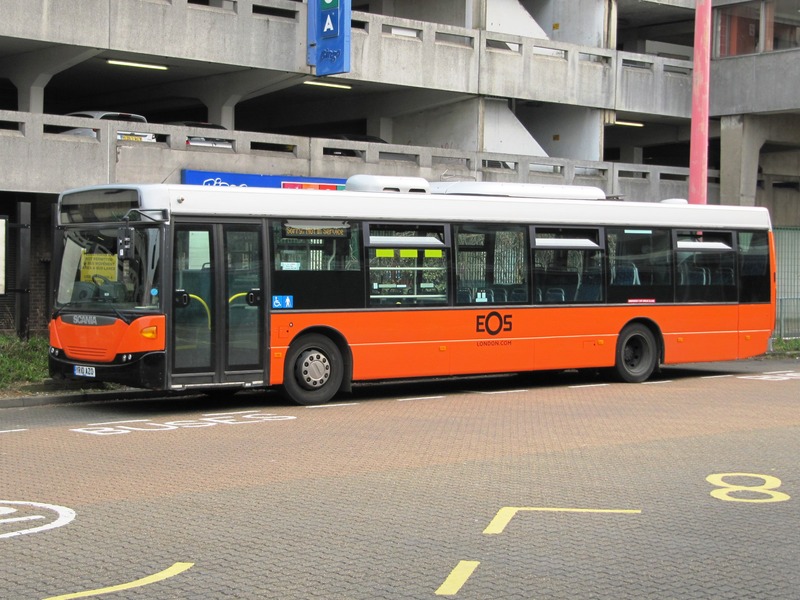 Their ECC supported 2-hourly 501 service will be replaced by an improved commercial service over the same route (Harlow to Ongar) by Trustybus. 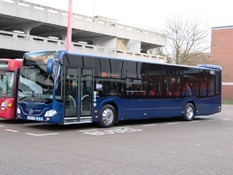 EOS have acquired 4 Alexander Dennis Enviro 200 / MCV Evolution vehicles. 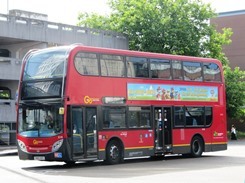 All were purchased new by Docklands Buses for the take-up of TfL service 167 and subsequently transferred to the Goahead group upon the purchase of that company. 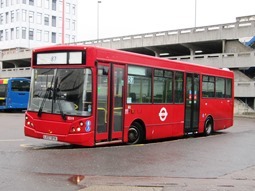 Registration numbers are LX07BYK (formerly Docklands Buses fleet number ED19), LX07BYL (ED20), LX07BYN (ED22) & LX07BYT (ED27) and all are operating in TfL red with the conventional blind apertures still in place. Visually very similar and from the same source, although more often used on the W19 or 193, Trustybus have acquired the earlier and also shorter B23D version in Alexander Dennis Dart SLF / MCV Evolution AE56OUP (ED16) & AE56OUS (ED17). Again they are in TfL red but with a front LED display fitted. - Scania L94UB/Wright Solars YN05WKD and WKE. These slot within the existing batch. - Scania Omnicitis YN56NNE and NNG. 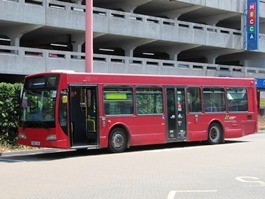 These are the first of the type since the large fleet of former Metrobus vehicles entered service just over 2 years ago. 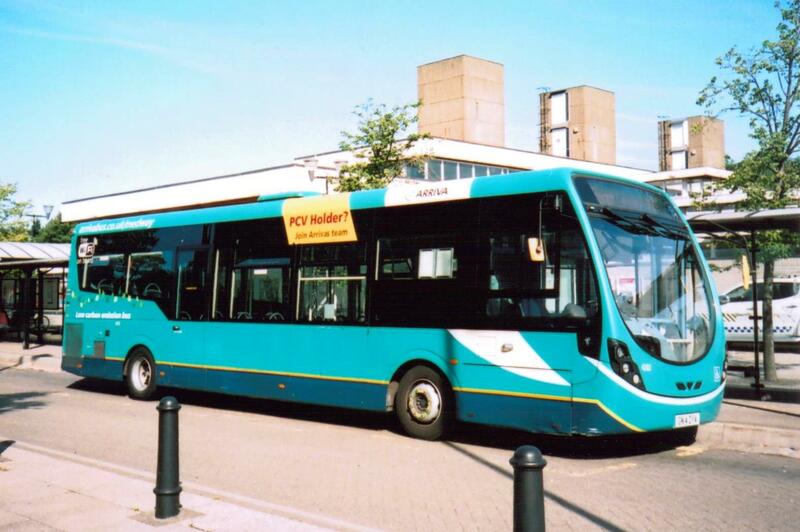 These are former Stagecoach Midlands vehicles and unlike their predecessors, they are single door. A new sighting at ECT on the 381 is Mercedes-Benz 515CDi / UV Modular WX07UHM. Competition returns to Harlow! Even though there has been something of a breakout of peace on commercial routes since the demise of Townlink and Roadrunner, in fact it's never been too far away. 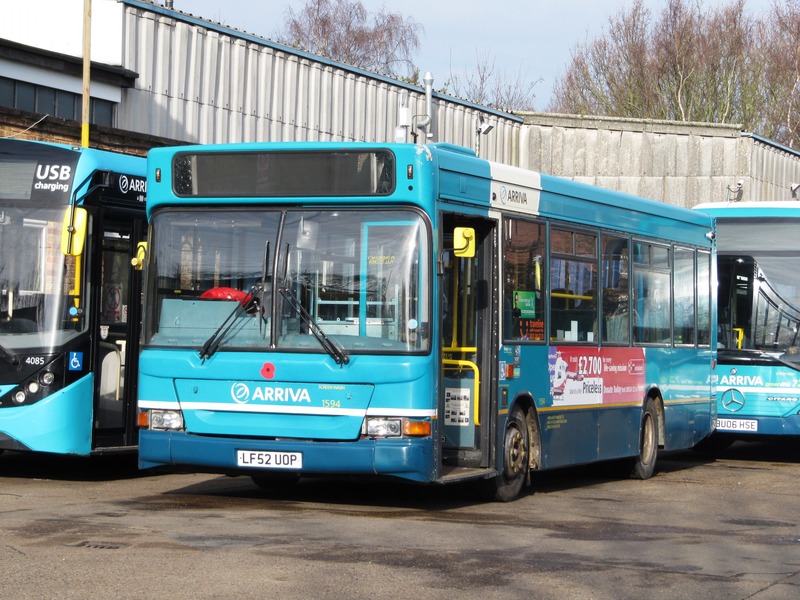 Trusty's 410 might seem to have the road from Harlow through Stanstead Abbotts and onwards to itself, but it is doubtless an irritation to Arriva, who not long ago uprated the 310. The lucrative part of both routes will be the shared section between Hoddesdon and Waltham Cross. 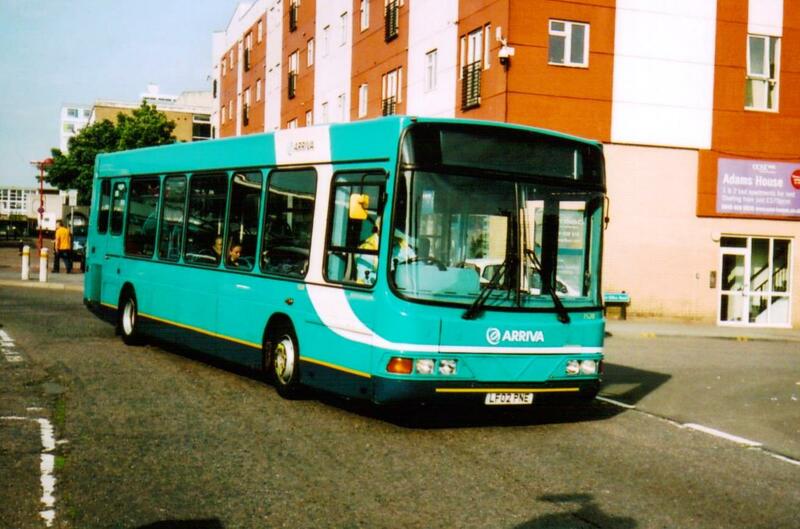 We cant say whether the two things are linked, but it must have been quite a shot across the broadside for Trusty to see Arriva recast local Potter Street route 9 with an extension to Epping and an upgrade in vehicles from Solos to full sized Volvos. Trusty have responded with something of a restructure of their own 419/420 to offer a more standardised high frequency on the core Harlow - Thornwood - Epping - North Weald section (the Ongar element continues largely as now). They have also registered a new competitive Church Langley local service (40/40A) from January. It looks as though 2018 will be an interesting year. Regal bows out. In August we reported the near elimination of Regal from the Harlow and Waltham Abbey areas, places which had seen their presence for some 15 years or thereabouts. 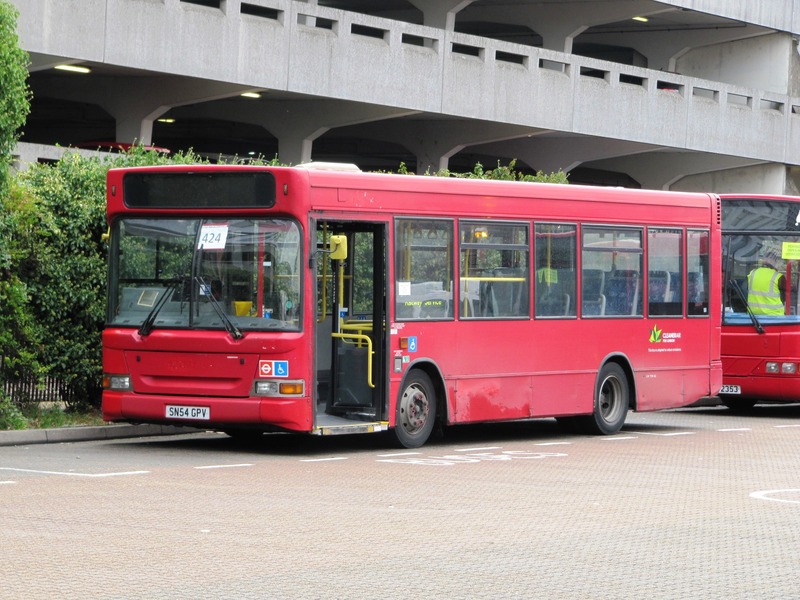 Not only has the end now come in Harlow with the deregistration of the 322 at the end of this school term, but also the second half of 2017 has been characterised by the progressive withdrawal of all remaining Regal bus services, the last in Essex ceasing in the lead-up to Christmas. Regal undoubtedly filled a gap in providing some useful commercial services and reasonably-priced tendered operations. The standard of vehicle and driver presentation, destination displays, passenger information and operational reliability varied considerably. 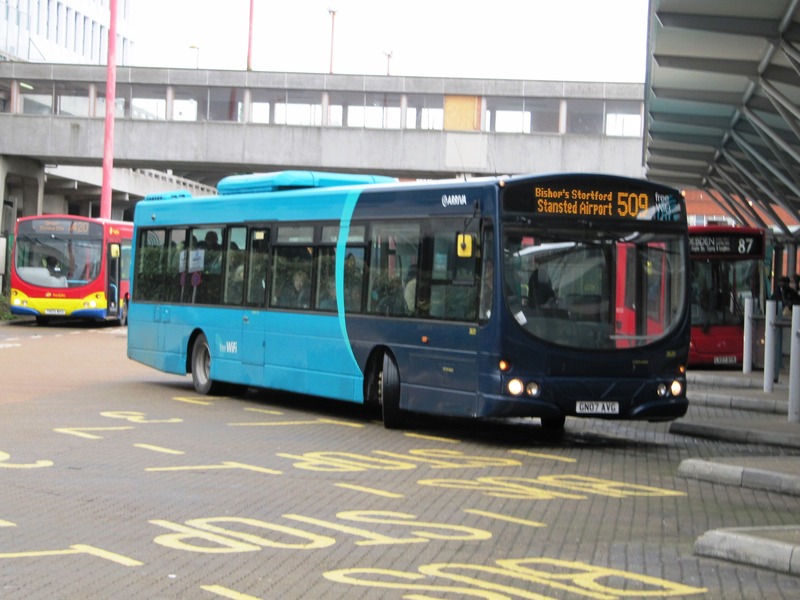 The changing landscape for the support of bus services suggests that few parts of the once extensive network will be replaced. 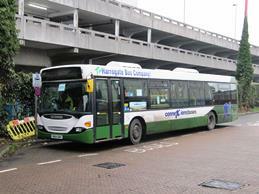 Regal will continue as a coach operator. It may be that they chose their time wisely. The expansion to Arriva route 9 has seen the return of a couple of the native Volvo/Wrights which only left for Stevenage in the summer. 3856 (KE54LNR) and 3874 (KE57EPC) are the vehicles in question. 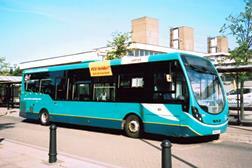 Also returning is native Optare Solo YJ57EJK. This is numbered 2488 due to having been at Ware when the others were renumbered to the 1xxx series. We've added Mercedes-Benz Sprinter/Treka WR58LJL to the fleet of Essex Community Transport after it was noted on the 381. A second Mercedes-Benz Sprinter City has entered service at EOS. Logically following on, it is registered BG63VUW and is in white livery. Logically this would be numbered 602. 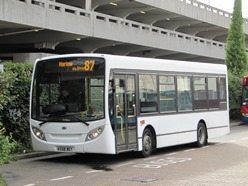 PVL398 (LX54GZK) is a noted addition to the Go-ahead commercial services fleet and was noted on the 575 on 22 December. It carries the yellow/grey skirt and has LED displays but retains centre doors. 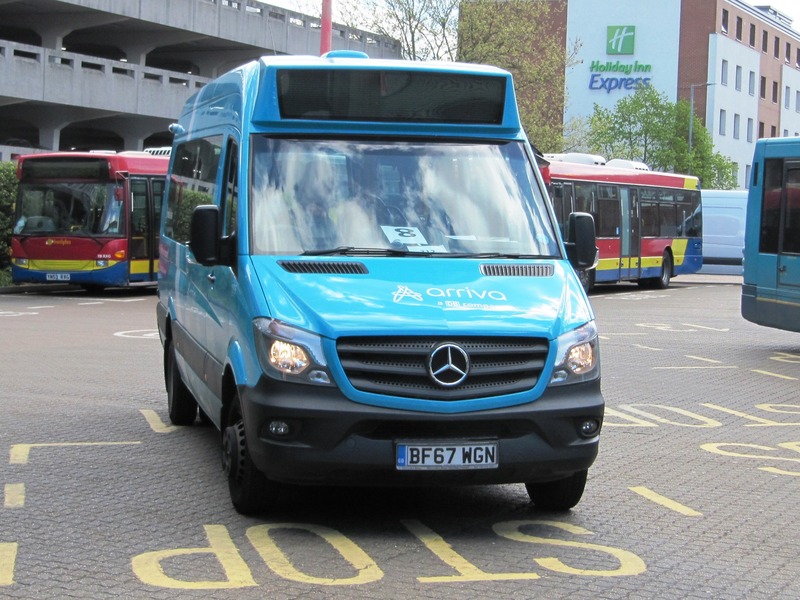 EOS sees the future of route 87 in the hands of rather small Mercedes-Benz City Sprinters. BG63VUV has been noted in service and carries fleet number 601. 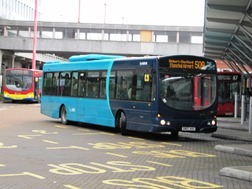 Trustybus have added Transbus Mini Pointer Darts SN03YBK and SN03YBS along with blue-liveried Optare Solo M850 NM02DNU to the fleet. At EOS school service 133, from Debden Park School to Chigwell, Grange Hill and Abridge is carrying loads which need a double decker. 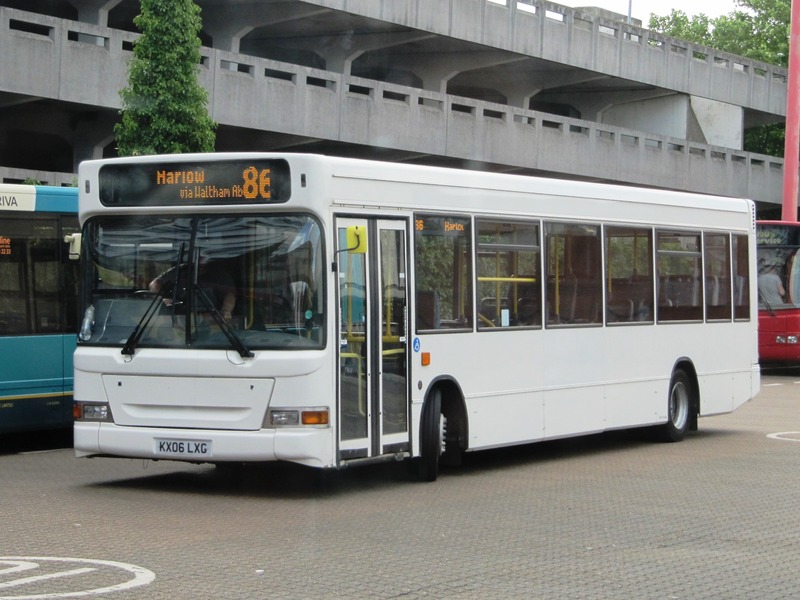 We assume that Volvo B7TL / East Lancs Vyking PJ02PZF as been acquired for this operation, although on 12th October it was seen in Harlow carrying displays for route 86. 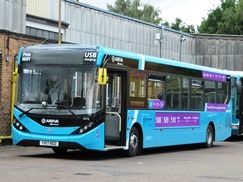 Meanwhile one the Enviro200's acquired last month, GX09AGZ, has been reregistered EOS711, a mark previously carried by a Toyota BB50R/Caetano Optimo C22F, which we assume is now gone. 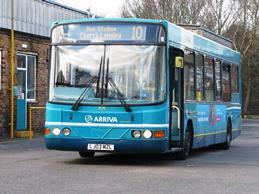 The loan situation at Arriva would seen to be resolved. 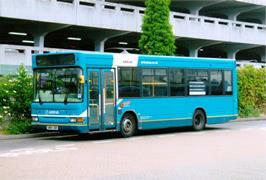 From those vehicles which saw use, 3312, Volvo B10BLE / Wright Renown PN02HVL, would seem to be a keeper. 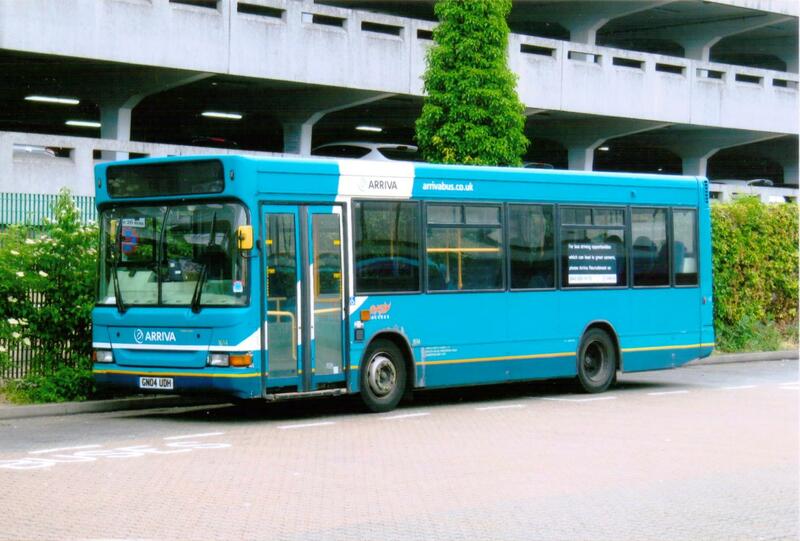 Meawhile, Optare Solo 1466 (KE55KTD) has been repainted out of Network Harlow blue into standard Arriva livery, leaving just one, 1454, remaining to be dealt with and representing the last memory of the era. An unexpected windfall for Trustybus as Acme have suddenly pulled out of tendered bus work, meaning that Stansted local route 7 will pass to them. 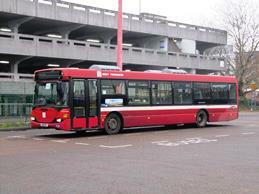 Whether related or not, all-red Alexander-Dennis Mini Pointer Dart SN54GPV has showed up in service. Trusty also gained in the recent tender rounds in picking up the Sumners Farm local route 5 (their existing Pinnacles section of route 5 was retained but renumbered 14) although there was a reduction on Harlow to Loughton route 418. Also stepping-in as a Acme replacement, a reprieve, just, for Regal. 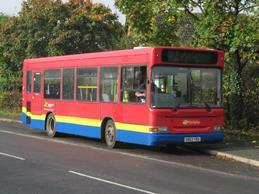 School service 322 was never taken up and so seamlessly starts the new term without any change of operator. 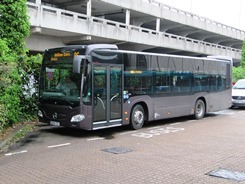 A class to reappear with EOS is the Alexander-Dennis Enviro 200. All white liveried KX58BGY was sighted from 4th September. This vehicle once worked locally with Amber. Joining it is GX09AGZ. 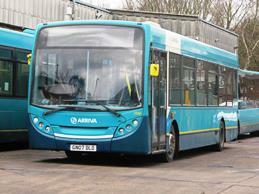 Loans continue to appear with Arriva. Volvo B10BLE/Wright Renown 3312 (PN02HVL) noted from 11 September. 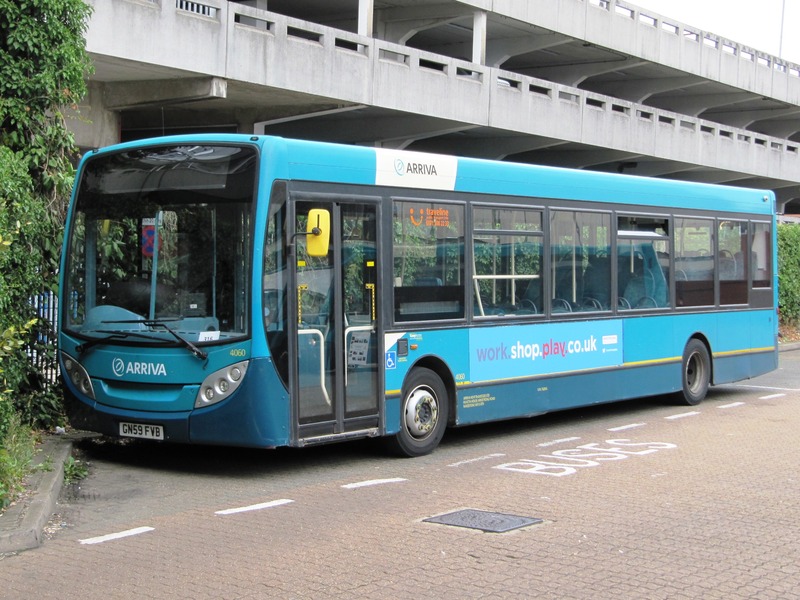 Following the outward transfer of most of the Volvo/Wrights at Arriva in Harlow, it would seem that there is now something of a vehicle shortage, caused in part by a couple of accidents. 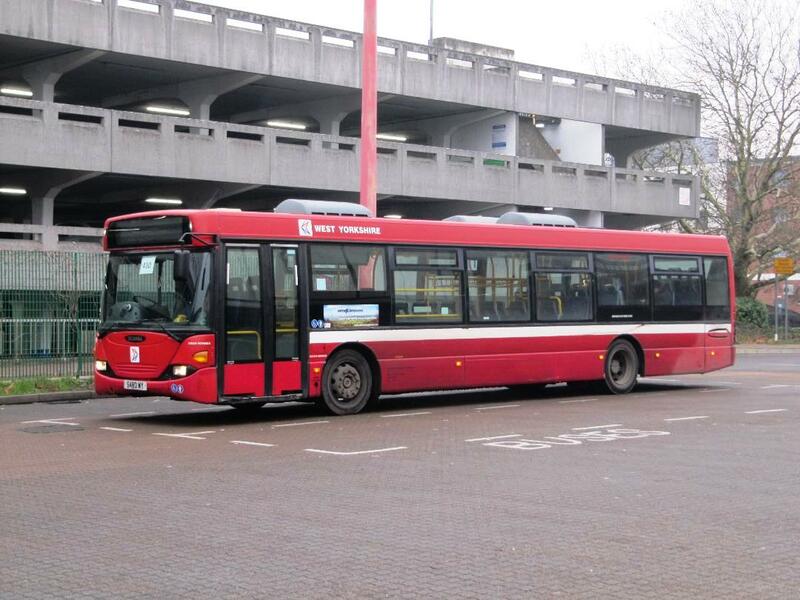 Noted back in service, former Harlow resident Optare Versa 4228 (KX62JTV). Alongside this, bringing the class back to the town, Dennis Dart SLF/Plaxton Pointer II 3285 (Y385HKE), then less usual VDL SB120/Wright Cadet 3528 (LF02PNE) and Volvo B10BLE/Wright Renown 3313 (PN02HVM) along with VBL Bus SB200/Wrightbus Pulsar 2 3412 (KX09KDV). Other than the Versa, the other recent arrivals are assumed to be loans. 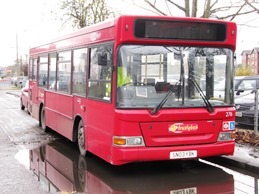 The influx of Dennis Dart SLF/Alexander Pointers continues at EOS with KP02PWV noted in service in all red. 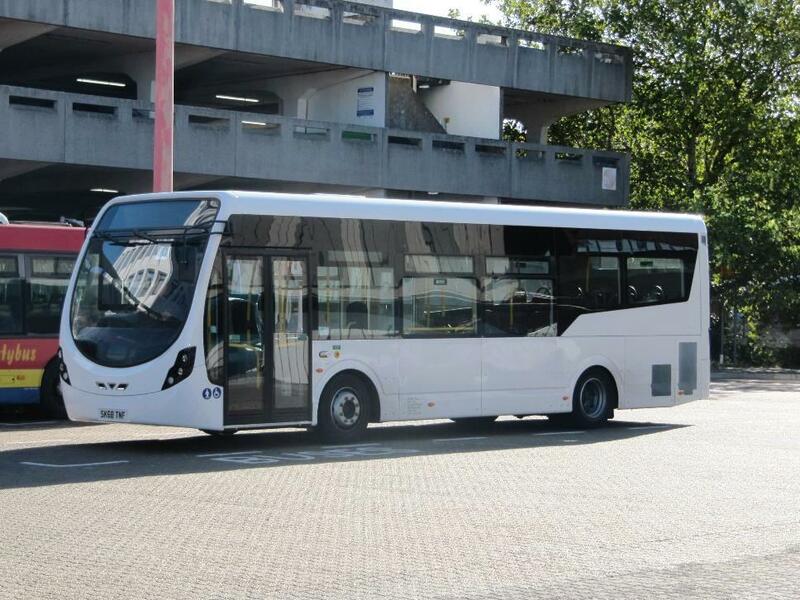 Meanwhile Scania Omniciti YR10AZO has received fleet colours and fleet number 701 in the process. 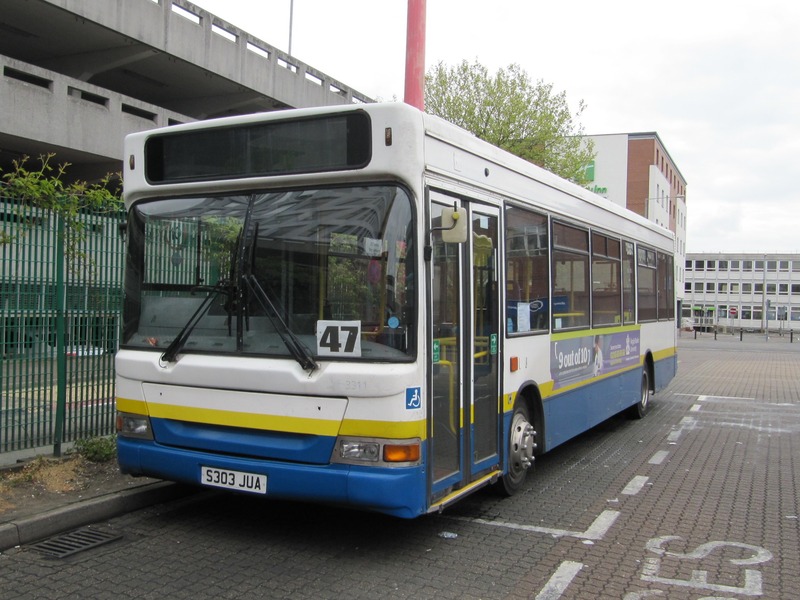 Dennis Dart SLF/Alexander Pointer KU52YKS, reported as acquired below in June, is in service in fleet livery as fleet number 743. Trustybus have added another 3 Scania L94UB/Wright Solar's to the 3 reported last month. Registrations this time are YN04GMG, YN04GMU and YN05WKK. - The long-standing but unnecessarily disjointed evening and Sunday networks have been revised to follow the weekday patterns to the largest extent, with obscure numbers like 1B, 3A, 6A, 8A, 11 and 12 being replaced by appropriate weekday equivalents. The anomaly of Pear Tree Mead being served only in the evening years after the main service was withdrawn has gone, as is the effectively Sunday-only service to Edinburgh Way. - Rural services provided by mainstream buses are now a thing of the past. 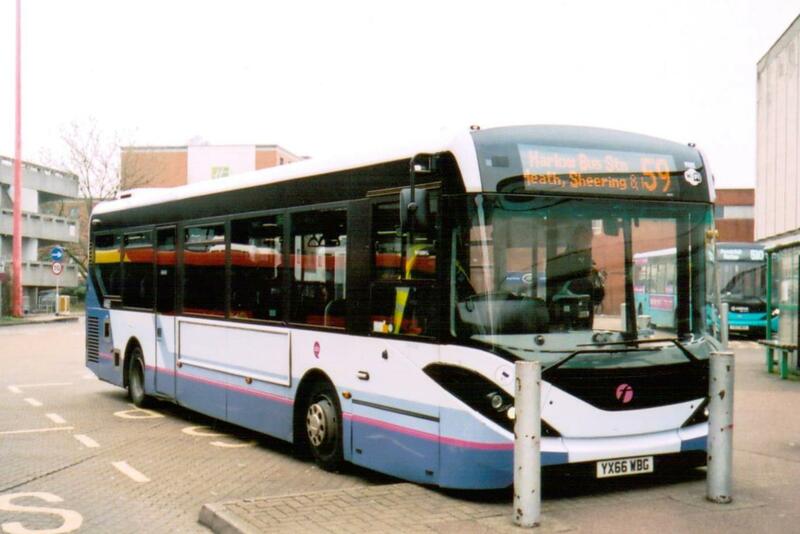 The recent past had seen the 7 (Churchgate Street), 347 and 392 replaced with occasional community services whilst the 354, 391 and service to Hunsdon have been lost altogether. In this latest round the 47 and 381 also make a similar transition, although the 381 is at least still 6 days a week and at a reasonable frequency. 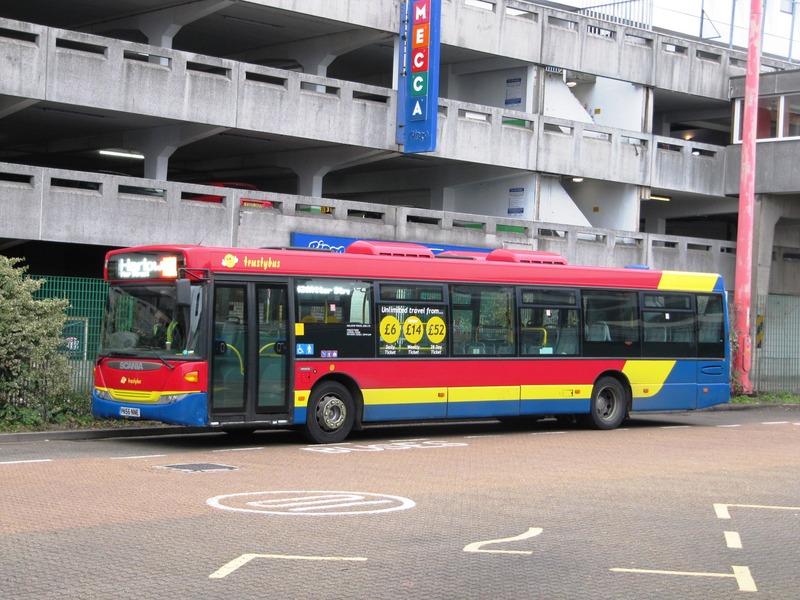 Whilst I recognise that these community services fill something of a need, they are not attractive enough for most users, are barely recognisable as buses, and are hardly likely to attract any new custom. Their tenure must surely be very limited. 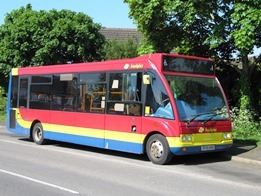 - Just outside of Harlow at Waltham Abbey, Regal-operated long-standing routes 211/2/3 also cease, as do the evening 250 and 251 together with Sunday 240/250 and 251. EOS have stepped in with some enhancements to commercial route 66 to fill some of the gaps. The combination of these changes removes Regal as an operator from the area. At EOS, this time not white or red, but fleet orange with black skirt. 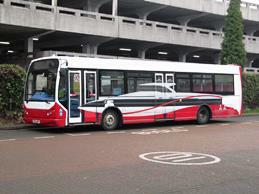 Dennis Dart SLF/Alexander Pointers KP02PUK & KM02HGE have been noted in service from 6th July. Also seen, "smart pack" demonstrator, black/grey/green Alexander Dennis Enviro 200 YX17NXA. London General seem to have upgraded part of the commercial fleet which operates the 575. 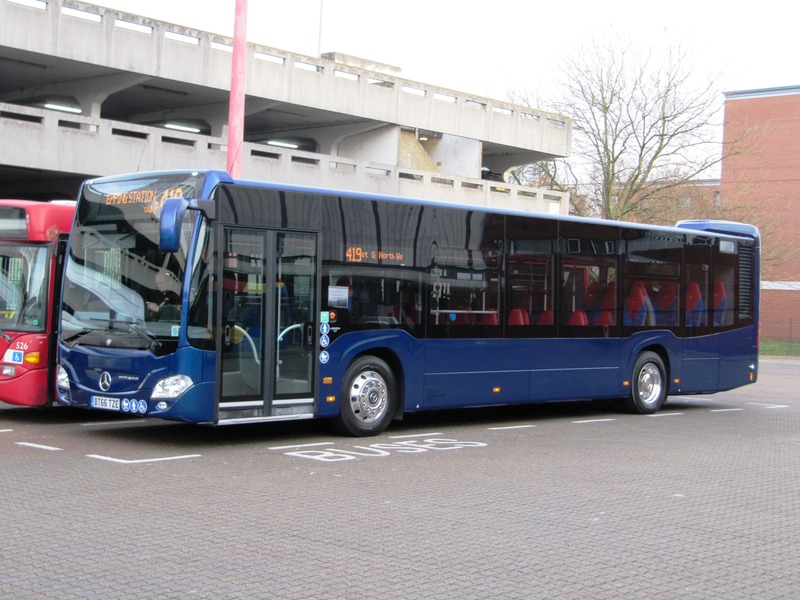 Noted in recent weeks have been Volvo B7TL/Wright Eclipse Gemini WVL250 (LX06EAP) and Alexander-Dennis's E135 (SN60BZG), E169 (SN61BGY) and single-door coach seated E281(YX14RTV). Trustybus have added to their fleet of Scania's, but this time it's the L94UB/Wright Solar variety. Three have been acquired, registrations TN05WKG, YN05WKH and YN05WKK. 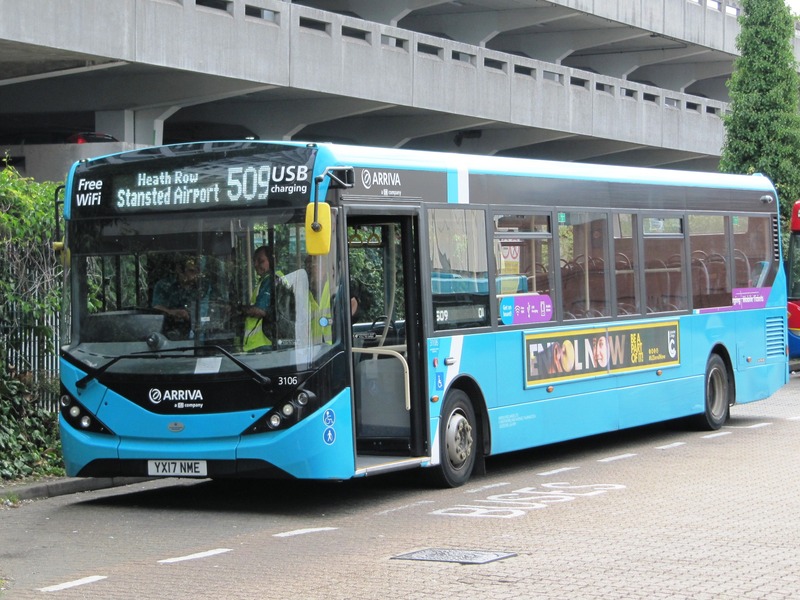 Major news at Arriva is that the 508/509/510 group has been upgraded with a fleet of 12 branded Alexander-Dennis Enviro200MMC's B45F. Fleet numbers are 4076-4087, registrations YX17 NGJ/N/O/U/V/Y/Z, NHA/B/C/D/E. They first examples were noted in service on 19th June and the whole fleet was operational by 28th June. At this stage all except 3 (4084/5/7) are route branded. The first noted stray of the new fleet was on 30th June when branded 4083 operated the 724 Harlow to Hertford shorts. The 11-registered Volvos are expected to be released. 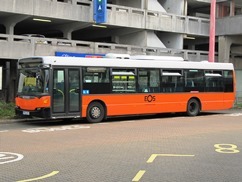 Optare Solo YJ06FXS (1453) has returned to Harlow after an absence. EOS have had a few of new vehicles operating lately. Alexander-Dennis Dart SLF KX06LXG and LXH are in all white whilst similar KU52YKO is in red. KU52YKS is also reported to have been acquired. It seems to be demonstrator season at the moment. Perhaps trumping them all in the something different stakes, Trustybus have operated a Yutong Bus and Coach ZK6128HGA Citybus during the first two weeks of May, registered YH66VMO. At Arriva, native Volvo B7RLE/Wright Eclipse Urban 3857 (KE54LPC) which has been away from the area for most of the last year has returned. EOS are still in the demo game. 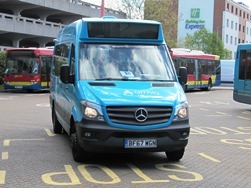 Seen on a Swallow private service for Harlow College on 16th May and then on the 86 on 17th May was Mercedes-Benz 0530K Citaro demonstrator BV14TZY. Regal have put out a wide variety of vehicles of late. 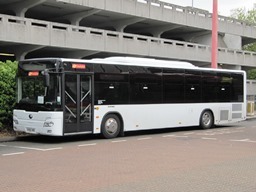 Better from a comfort and size perspective on the 47 on 13th May was Mercedes-Benz 0814D / Plaxton Cheetah YN06RVP. Alas it fared no better for blinds than some of the other non-standard offerings. The vehicle is in a blue-based Regal explorer livery. Previously unseen with Regal, former Go-ahead London Volvo B7TL/Wright Eclipse Gemini LF52ZSD was noted on the 147 on Wednesday 12th. Similar vehicle LF52ZTL is also reported acquired. This was followed on Saturday 29th by TGM-liveried former locally operated Arriva Dennis Dart SLF/Plaxton Pointer II S303JUA. 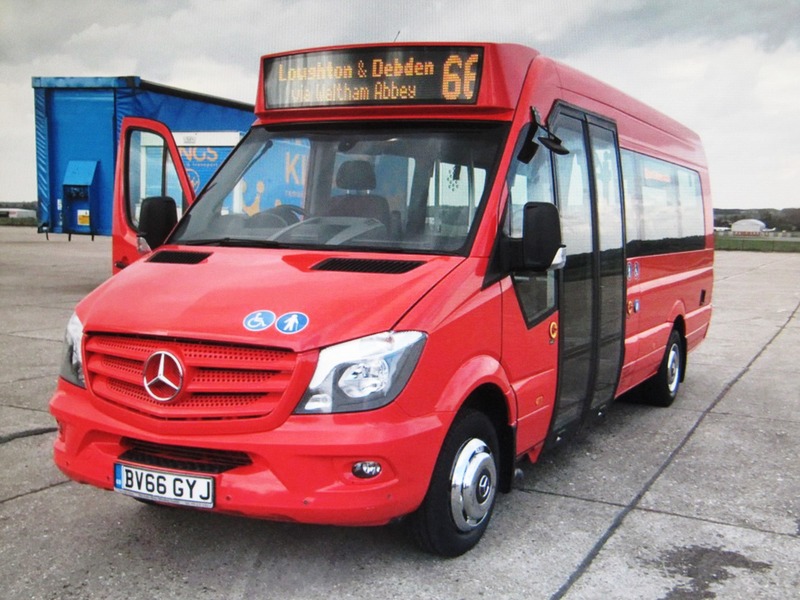 EOS have used all-red 13-seater Mercedes-Benz Sprinter City minibus demonstrator BV66GYJ on services around Debden. 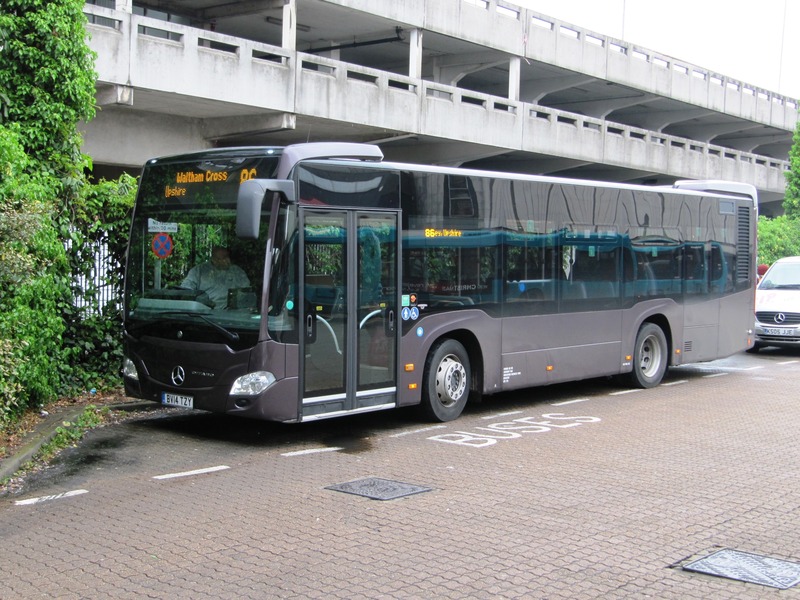 Seen in use at Trustybus, first noted on 20th February, Mercedes-Benz Citaro demonstrator BT66TZE. All-over deep blue livery is carried. 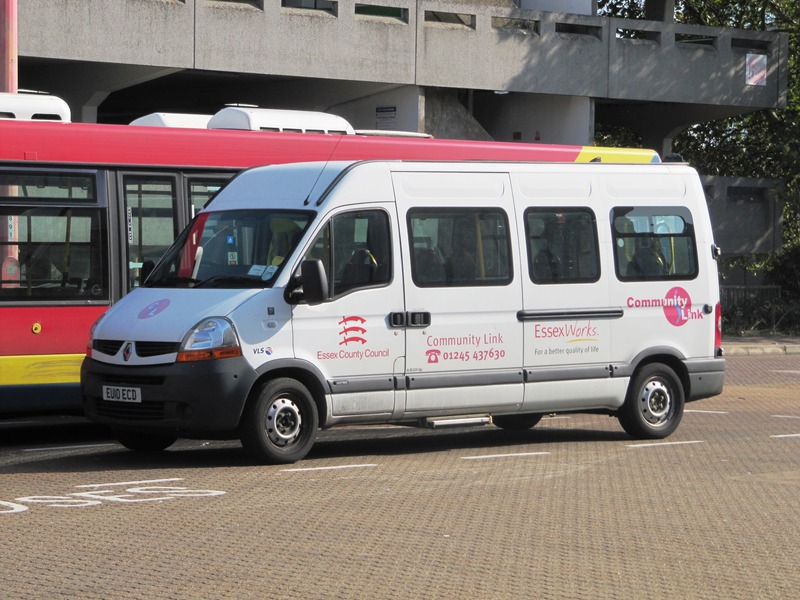 Competition in and around Harlow has been very much reduced since Townlink and Roadrunner ceased operations in early 2016. There had of late been a little from EOS on the Sumners/Katherines route, plus a little on the Epping via Epping Green corridor. 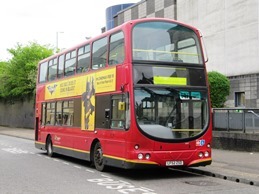 On Tuesday 17th January things took a step-up a gear when EOS started operating a route 500 between Harlow and Epping via the Thornwood and the existing Trustybus 418 service, every 20 minutes, all day from early until late on Mondays to Saturdays. The service operated on the Tuesday and the Wednesday, but was no longer operating on Thursday. EOS advised that an agreement had been reached and that Trustybus would be accepting EOS tickets. Not related to the cessation of the 500 service as far as we are aware, there was a reasonably serious accident at Thornwood on 18th January. EOS Transbus Trident II/Transbus President 9.9m 100 (LT02ZZV) plus 2 Trustybus vehicles, of which Volvo/Wright WNZ1103 was one and has since been reported as withdrawn. 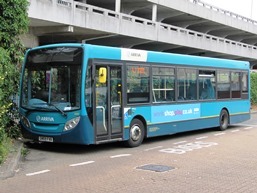 Over at Arriva, the now Arriva-liveried Citaro fleet have been frequent visitors to town route 10, providing one or both of the allocation. 3898 (BK58URL), the one which has not been noted as repainted, has not been seen in service for some months. Please note that this is an unofficial site, and whilst every effort has been made to ensure the information is accurate and up to date, no claims can be entertained for losses caused by any errors or omissions here, or through any shortcomings on the part of the operators themselves. We would be grateful if any errors could be notified to us, in order that we can make a prompt correction. Any suggestions, comments or other forms of feedback are most welcome. This site acknowledges the support provided by local operators, but is not directly linked with any operator.